(Oklahoma Historical Society Newspaper Archives, OHS). Chattanooga is located in the far southwestern corner of Comanche County, just east of the county line between Comanche and Tillman counties. The town is on State Highway 36 about twenty-two miles southwest of Lawton and fifteen miles due north of Grandfield. The town originated following the August 6, 1901, opening of the Kiowa-Comanche-Apache Reservation to non-Indian settlement. N. C. Sisson named the community for his hometown in Tennessee. Sisson, along with T. E. Richey and E. C. Blake, formed the Chattanooga Town Company and received the patent for the townsite on December 18, 1902. The Chattanooga post office was established in January of the following year. Aiding the early development of Chattanooga was the Chicago, Rock Island and Pacific Railway, which extended a branch line from Lawton to Chattanooga in 1903. This line was a major factor in the advertisement of the town in 1906. It provided the closest rail access to the Big Pasture, which opened to general settlement that year. In 1920 the branch line was completed south to Grandfield; however, the entire branch was abandoned in 1942. Like many towns with rail access, Chattanooga quickly became an agricultural center. By 1912 the town had three cotton gins in addition to a lumberyard, a feed yard, and a variety of other small businesses. In 1930 Chattanooga boasted two gins and two elevators. In 1907 Chattanooga had a population of 362. Three years later there were 471 inhabitants. In 1920 the community reached its all-time high of 507, aided by oil and gas well drilling in the vicinity. By 1930 the population had dropped back to its exact 1907 number. Chattanooga's population then remained in the 300s until 1980, when it topped the four hundred mark by three persons. The population reached 437 in 1990 and remained stable, to number 432 in 2000 and 461 in 2010. 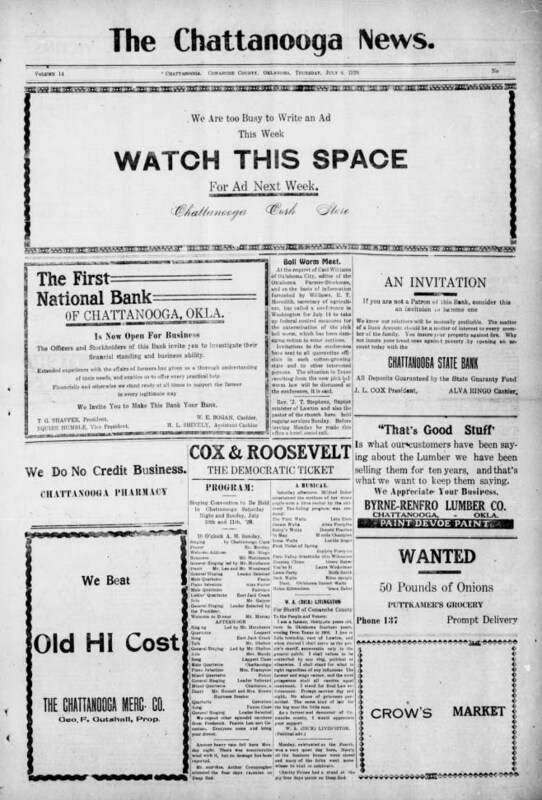 Since the 1920s Chattanooga has not had its own newspaper. The town's only newspaper, the Chattanooga News, began publication in 1904 and was discontinued in 1929. Daily Oklahoman (Oklahoma City), 8 July 1906 and 9 September 1917. Lawton (Oklahoma) Constitution, 9 October 2001. Sanborn Fire Insurance Maps, Chattanooga, Oklahoma, 1912 and 1930. Cynthia Savage, "Chattanooga," The Encyclopedia of Oklahoma History and Culture, https://www.okhistory.org/publications/enc/entry.php?entry=CH009.